Disney silver coins from the New Zealand Mint are the ideal choice for those who want to add quirky and original pieces to their collection. And, thanks to their .999 purity and low mintages, they are also an inspired choice for collectors who want to boost their portfolios with fine silver. 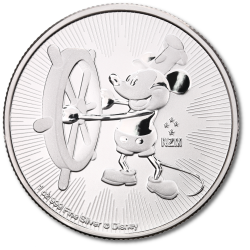 The series began in 2017 with the Steamboat Willie silver coin featuring a reverse design based on Mickey Mouse's first appearance on film. A boxed set of colour enhanced silver coins celebrating 50 years of the Jungle Book followed the same year. The obverse of all silver Disney coins features a portrait of Her Majesty, Queen Elizabeth II. These beautiful and highly collectible coins are legal tender on the Pacific island of Niue and guaranteed by the government of New Zealand.